Greetings from the "Gateway to the West!" We got a very late start this afternoon, but had a good drive-- until we got into St. L., by which time it was getting dark and drizzling so that all the lights were reflecting, and (since I managed to leave the GPS home) uncertain of exactly where the motel was for which I had made reservations. I had the address, and I had looked at the map cursorily earlier, but--not counting on my latest lapse, not closely enough. June thought she had found the right exit, but it didn't match what I thought the road name was supposed to be and drove another 10 miles before I pulled over to call. I didn't have the motel's phone number, so I called directory assistance where some very pleasant people shared with me, frankly and openly, as communication between fellow human beings should be, that they had no listing of any motel of chain H at anywhere like that address, but they generously conveyed to me the toll-free number for the chain. I called the number purportedly belonging to the chain, and then went on the quest to make it past the nosy computerized machine that inquired after a lot of irrelevant information.This was not the time to get me to sign up for their special bonus programs . Finally, after I had sapped the machine's morale, it allowed me to speak to a very pleasant human being, who listened to my problem, suggested that I call the motel itself, a piece of practical advice that almost took me back to "square 1," but the gentleman also immediately supplied me with the number. I thanked the well-informed asset to his company and called the number. It became obvious pretty quickly that it was a motel because nobody answered the phone for about five minutes before someone picked up. Then another person in the smooth voice of people who have advanced their career to the front desk, gave me directions. The directory assistance issue apparently is due to the fact that the particular place operates under a second name that endows it with local color, with the name of the chain a bare subheading. Now, do I really have to tell you that the exit we needed to take was the very one that June had thought was the likely one? Nobody responded to my quick parenthetical inquiry in the last entry as to the reference for Professor John Keating. He's a character in a movie. As far as the actor goes, in my opinion this is his only decent performance, though he got famous with a rather successful TV show and has made lots of movies. Any guesses now as to the film? Speaking of such things, I'll add another set of questions in a totally different direction. The picture of the arch dates from 2006. 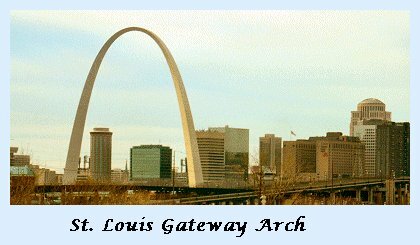 In geometry, what do you call the shape of the St. Louis arch? What is an (at least approximate) formula for it? Who orginally worked out the mathematics for this shape? Well, that's enough. I'm going to try to sleep for another hour or so. Then our little wagon train, consisting of one Dodge Dakota, will head out further West. Thanks for your prayers. A quick entry. We have arrived in Topeka, Kansas, our final destination, and are enjoying the hospitality of some very wonderful people. The only other time I've been in Kansas was just a few miles from the Kansas City airport, so this is my first real exposure to the state, and I'm totally surprised. It's not at all flat. The nice rolling mountains of Missouri have just continued into Kansas; it would be really beautiful if the trees would only get with it and start growing their leaves. So, we're here, and I'm doing a mini-mini seminar, hosted by one particular church, but attended by leaders from various churches in the area. The topic is the Bible in comparison and contrast with the scriptures of other religions. Tonight I gave my talk on the historical reliability of the gospels (Chapter 10 of No Doubt About It), followed by half the video on Judaism, and then talking a little bit about excerpts from the Talmud. I made a hand-out of the various scripture excerpts (purely public domain, of course) on which we're talking. Once again, I'm following my strategy of using some self- contained PowerPoints or videos, so that I don't actually have to be in action the entire time. It's Sunday, and we're not in Kansas anymore. We're somewhere between Kansas and home after some really good days in Topeka. We're planning to be back home sometime tomorrow (Monday). This is another one of those entries that has been trying to hatch from its egg for several days, but . . . I have no idea where this metaphor might take me, so I think I'll drop it right there. (I said "drop," not "lay.") The point is that there's been too much use of my energy in other ways to get a blog post together. The short time in Topeka was memorable. The seminar was good, I guess (Okay, in response to the earlier posting of this entry, I will concede that it went very well. ), but meeting the people and making new friends was even better. Our hosts were wonderful and generous, and I sure hope we will be able to keep in touch with each other for a long time to come. My last post was on Wednesday of last week, I believe, at least by coverage, if not by "date stamped." Of course, we will pick up Hegel and 2 Kings again, but travelogues have to take precedence. Thursday turned out to be a long day, and I believe it will be best if I stay with Thursday for this entry. 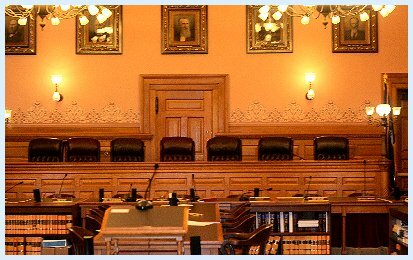 In the morning, Randy M. (who had invited me to come to speak in the first place) and his family, plus June and your meandering bloggist, visited the Kansas State Capitol building. Randy has a friend there, who holds Bible studies, prayer meetings, and counseling with state legislators, and he was our guide for the first part of the tour. When he had to leave us, a professional guide took over, and we'll get back to him later. 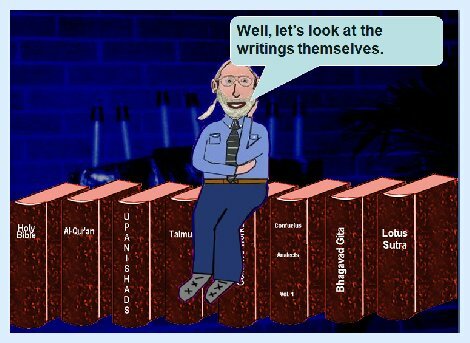 Then in the afternoon, I spent most of the time (but not enough time), trying to make the Islam Powerpoint self-contained, a last-minute project that wound up exactly the way that last-minute projects usually do. So, during the seminar that evening, I could not make use of the self-contained PowerPoint, which meant it took a whole lot longer to get through the basics of Islam. The reason is the obvious one, which faithful readers of my blog (forgive the redundancy) have come to expect: I start stacking stories within stories, obviously. That reminds me of a minor surprise for both June and me on our trip to Kansas. 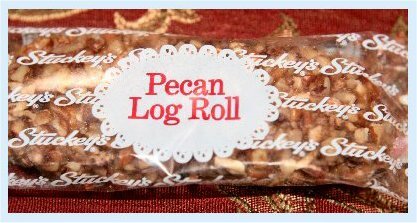 Both of us had thought that Stuckey's, the chain of roadside restaurants and gift shops, specializing in "pecan log rolls," had been gone for a long time. 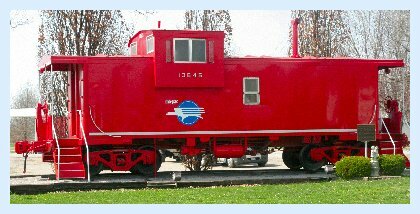 But there actually was one along the highway in Missouri. Since we needed to take a short break anyway, we took advantage of the opportunity to stop there. When we checked out with our snacks at the cash register, June said that it had been a long time since we had seen a Stuckey's. The lady at the register replied, "This one will be sold officially tomorrow." As Heraclitus said, You cannot visit the same Stuckey's twice, or words to that effect. A visit to a state capitol may or may not be interesting. If it had all been on the level provided by the professional guide, it would not have sparked my interest as much. He covered the basics, but seemed to be enthralled by such ite as when such-and-such columns were added or when the carpet was installed in the Senate chamber, ite which hold my attention for precisely 3.9 seconds on average. Earlier, under the leadership of Randy's friend, things were far more personal, and we met various Christian people carrying out various tasks in the building. For my purposes in sharing with you what I learned, I will now proceed in several stages, starting with the expected modalities of a statehouse and then focus on the really intriguing stuff, namely, the murals on the walls in the lobbies and corridors and the stories they represent. Needless to say, a tour such as this one brought out the "Hermione" in me, and the way in which some people reacted to the questions I asked them were easily as interesting as the answers the elves. So, the first block of pictures below is fairly self-explanatory. 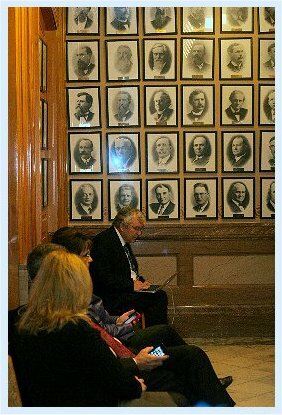 Lobbyists waiting around in a lobby. 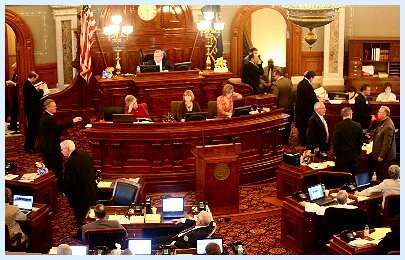 As in Indiana, Kansas was in the final stages of wrapping up its session, which meant focusing on getting the budget finalized. 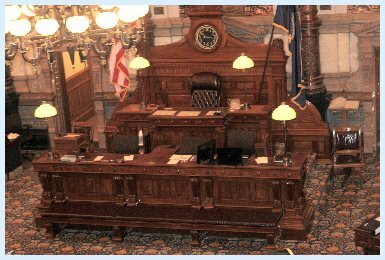 Apparently, though, the Kansas representatives displayed more professionalism than some of their colleagues in the Hoosier state. We met some Christian ladies, who take turns volunteering in the building handing out buttons that simply said "Pray." Their two main points of concern: a) corruption in the government, specifically within the administration of gambling casinos, Kansas being the only state in the union to have state- operated casionos, and b) what they called the "Community Defense Act," which is a law that allows communities to keep out undesirable businesses. It appears to me that the good people of Kansas have allowed some ketchup to leak out of the bottle that is going to be very difficult to squeeze back into the bottle. Once you let these kinds of matters get beyond regulated by local zoning ordinances and adjudicated on the level of county courts, they are in the hands of people with very different agendas than you're living in an environment that is safe (in all senses) for you and your children. June and I gladly accepted the "Pray" buttons. God knows the Indiana Assembly needs its share of divine intervention. Now for the murals. Let's start chronologically, though I reserve the right to break the time sequence eventually. 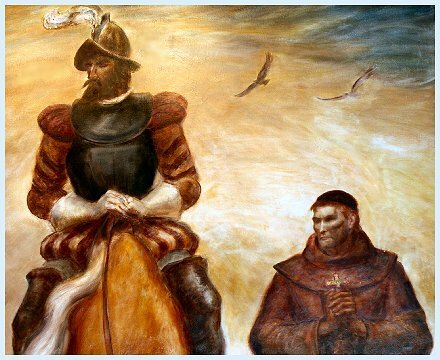 The Spanish conquistador and administrator of several provinces in Mexico, Francisco Vásquez de Coronado, had been ordered to find a city, called Cíbola, that was reportedly built of gold. His source for this information was the priest, Marcos de Niza, who had returned with this news from an exploratory trip. However, when Coronado, accompanied by numerous priests, soldiers, and local recruits, finally reached the purported location, all they found was a set of pueblos occupied by Native Americans. Perhaps the pueblos looked golden- colored under certain lighting conditions. However, that was not even close to the end of Coronado's search. 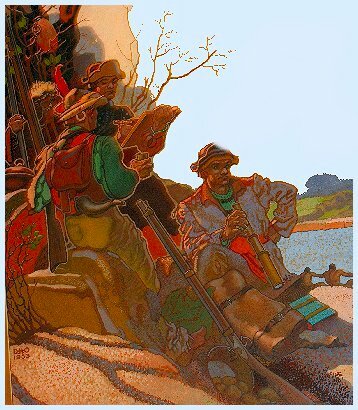 An Indian, whom everyone called "The Turk," wound up leading Coronado and his slowly diminuishing following along a wild goose chase, claiming that he knew a way to the real thing, a city called Quivira. The Turk led Coronado through the Llano Estacado, across the Rocky Mountains, and eventually all the way to Kansas, where the promised Quivira was nothing but a village of the local population, dressed scantily due to the summer heat. However gold or not, Kansas lays claim to the dubious fame of having hosted Coronado at the end of his forelorn quest and, one might mention, the execution of the creative "Turk," who must have known that he could not get away with his long-term practical joke forever. By the way, note that the priest alongside Coronado, maybe the adventurous Marcos de Niza himself, is carrying a cross. Could this be the "Cross of Coronado," of which Indiana Jones said that it belonged in a museum? Experience has taught me that the Bravenet blog system does not care for my mammoth posts. Furthermore, due to massive stor here and all around us, the Internet connection is coming and going, so I'll try to take advantage of it having come and break off here. If this parcel makes it up okay, there'll be another one following immediately, and very likely a third one, which is already written for the most part right thereafter. It's taken forever, just to get the correction for this parcel uploaded, so I'll try the rest tomorrow. This is Monday, and we're still not home. It's just a few more hours, and we're planning on getting there tomorrow morning, but, not needing to go into the details just now, June suggested that one more night out to get more rest would be very helpful, and I have good reason to believe she is right. It's obviously tied to the PD. Happy Birthday to my dad, who turned 85 today! I'll call tomorrow (Lord willing). Yesterday I wrote one of those pamphlet-long blog entries and then realized that trying to upload all of it at once to my Bravenet site would result in either their server or this bloggist having kittens. As fond as I am of cats of virtually all varieties, these are not the ones I wanted to have crawling around, and so I decided to break up the entry into three, intending to upload them pretty much one after the other. Unfortunately, doing so became impossible because there were some fierce stor in the area, which interfered with the internet connection, so I'm going to try to finish the job tonight. In the meantime, I am, of course, running across this and that needing to be changed or improved. 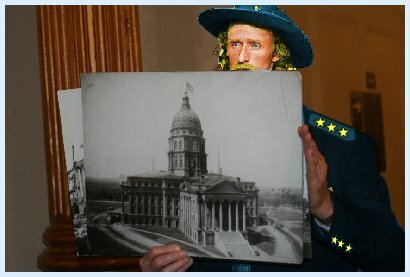 I'm in the process of commenting on our visit to the Kansas State Capitol in Topeka, KS, and, specifically, some of the intriguing murals on display. Unsurprisingly, since Lewis and Clark headed west from Missouri, the next state they traversed was Kansas, and so they received a mural in the capital building. At that time, the more important Native tribes in this vicinity were the agricultural and settled Mandan and Kansan, the nomadic Cheyenne, and the Sioux, who were in the process of resettling the elves; they would be greatly aided in this endeavor not too long thereafter, thanks to the horses that strayed from the Spanish invaders. 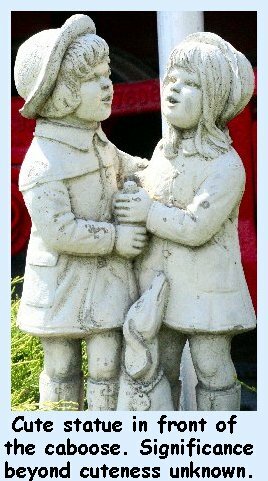 We'll come back to them later, just as I said with regard to the tourguide, and that is not an accidental association. 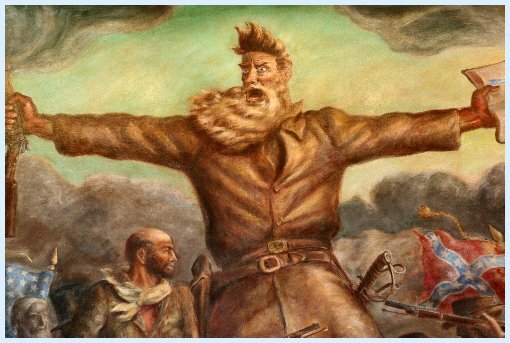 The mural featuring John Brown is as huge as the man himself was. I have visited Harper's Ferry several times, but I was not aware of his importance in Kansas. Douglas O. Linder (2005) has provided a very readable summary of the life of Brown, the events that led up to his trial, and the trial itself. In 1859, when Nebraska and Kansas joined the union, the residents of the respective territories and their friends, families, and masses of paid recruits voted whether they would line up with the slave-owning Southern states or with the free states of the North. John Brown, of Eastern Presbyterian stock, had been raised on the principle of the equality of all human beings as the obvious truth that it is (though only in a theistic world view), and so it was natural for him to become active in the underground railroad and then to promote the abolitionist cause in Kansas. The underground railroad worked fairly well in smuggling slaves out of the South, but in Brown's opinion it would not bring about a major change in the foreseeable future. Many of the people involved, who were risking their lives on a daily basis, were Quakers and Mennonites, and, thus, pacifists, while anti -abolitionists were murdering prominent people who were promoting abolition. The more Brown observed these proceedings, the more he became convinced that it would be necessary to end slavery by force of ar . Now obviously, if you're a pacifist yourself, you won't approve of Brown's eventual actions regardless of further rationalization, and I'll accept that for present purposes. I really don't want to begin a debate on this issue right now. Personally, I believe that physical violence is never a good thing, but that the demands of justice at times trump other considerations. Anyway, my former image of Brown had been based on the stereotype of his being a gun-happy madman, and so it caught me off-guard somewhat in reading up on what I had seen was how much of his thinking was imbued by (at least his interpretation of) biblical principles, and that he even considered his eventual use of ar a last resort, being convinced that the situation had reached such a point. Apparently, many people think that his "constitution" for a nation based on total equality was crazy because it was unrealistic. Maybe I don't know enough, but it see to me that it could also be considered to be visionary, and that people's judgment has been too strongly influenced by his defeat. I was surprised in what objective and neutral ter the plaque that went with the mural described the slaughter of the buffalo herds. The picture didn't make the weekend buffalo killers out to be heroes, but neither did it particularly point out what a crime they committed, in your bloggist's not-always-so-humble opinion. Hopefully, I'll be able to add the third installment within the hour. but then settled in again on "Renegade." Trying to be helpful to both of us, I honed in on one point, namely whether they had broken out of a reservation, but that specificity on my part did not lead to any greater precision on the gentleman's part. "Renegades" they were, and "Renegades" they would remain, and--communicated quite clearly non-verbally- -"Renegade Indians" was all that they were worth. The body and face language made it quite clear that my question was inconvenient, if not impertinent, and that spending more time on these "Renegades" would have no further value. Please bear with me here for a minute. It could be that the problem with my question and the off-putting response was simply because I had asked the otherwise knowledgeable gentleman a question that he couldn't answer. However, my experience has been that most of the time, the better class of tour guides does not necessarily leave it at that. Brother Wolf, who does tours in Sitka, Alaska, is forever studying and pursuing resources. For me, in the classroom, "I don't know, but I'll look it up," is usually a good thing to say. In cases of visiting a historic or a religious site, I have heard people say numerous times, "I don't know, but 'Joe' is our expert here on this topic, and I'll ask him right after the tour. So, be sure not to leave before I can tell you." Even if "Joe" turns out not to know, none of us winds up feeling stupid. But, as I said, my impression was that this reaction was certainly not about me or my question, nor necessarily about the guide qua guide, but ultimately about the Indians, and that "Renegades" was all they deserved in terms of appellation. This attitude really bothered me. These folks who made life difficult for some settlers and for the U.S. military had identities, of which their tribal affiliation was a minimal part. They were human beings with human motivations for their actions, and by leaving them nameless, they have lost their war twice, first on the battlefield, and second by being denied the most rudimentary identity. Well, there's no need for me to beat up on this particular gentleman any further. Having pursued the matter myself subsequently, I found out that, yes, indeed, there were some Sioux involved at one point, but that the main players in this confrontation from the Native American side were Cheyenne. Furthermore, the scenario was a part of the life and times of George Armstrong "Autie" Custer, which eventually ended with his so-called Last Stand, also known as the annihilation of the 7th Cavalry at the Battle of Little Big Horn River. What follows is my best attempt at reconstructing the events to which the mural and plaque may have referred, but I have tried to (re-)educate myself on details in a rather short time, and I welcome corrections, so long as you're nice about it. From a general perspective, the story of the Cheyenne is not all that different from that of so many other Native American tribes, signing treaties after treaties with the American government, ceding more and more territory, yet finding the treaties broken no sooner than signed. Nevertheless, as with any tribe, their story also has unique features. The geography of Native America was in constant motion, and the Cheyenne were not only under pressure from the American emigrants coming from the east, but also from the Sioux, who had their own troubles, driving them from the West. Both the Sioux and the Cheyenne may at one time have been settled and agricultural, similar to the Mandans and Kansans, but, if so (and I'm not convinced), by the time we get into the nineteenth century, they had left that way of life far behind and existed as nomads, primarily hunting buffaloes. They had moved into an area that included Kansas, which forced the Kiowa to move further south. But, of course, the further east they moved, the mover vulnerable they became to lose their land to white settlers. However, the American government guaranteed them protection, so why should they have to worry about it? Sadly, of course, we recognize that that's not how things went. Let me lay out some events here in sequence. 1851: The Treaty of Fort Laramie recognized ownership of the a rather sizeable territory by the Cheyenne and their brother tribe, the Arapaho. The area included parts of what we now call Wyoming, Nebraska, Colorado, and, of course, Kansas. 1858: The "Pike's Peak Gold Rush" triggered an inundation of white settlers in the area. 1861: The Treaty of Fort Wise gave up almost all of that land, and left the Cheyenne with the area called the Sand Creek Reserve in eastern Colorado. The highest chief of the Cheyenne, Black Kettle was among those who signed this treaty. There is a good summary of his life on the PBS site New Perspectives on the West. Black Kettle was convinced that in the long run his people could not win a war against the United States, and he was willing to make concessions because, as he saw it, the alternative would be annihilation. The ADL educational website recounts that in 1863 Cheyenne chiefs Black Kettle and Lean Bear had paid a visit to Abraham Lincoln, the "Great White Father," who had endowed them with "peace medals" and papers confirming that they were friends of the United States. After they returned, they flew the American flag over their encampment. There was, however, a serious problem with the Sand Creek Reserve. If anyone had brought a bison into it, it would find itself as a very lonely bison in that area. There were no buffalo, the staple of the Cheyennes' life, anywhere on the reservation, or even close in the vicinity. Thus, there was not enough food to go around. Empty stomachs lead to low blood sugar, and physiologically that condition is likely to bring out the hostile side of our natures. A similar effect can be brought about by injustice and constant mendacity. A number of Cheyenne declared that the chiefs who had signed the Treaty of Fort Wise had not represented the entire tribe, and continued as before, one of their main areas for hunting being in Kansas. 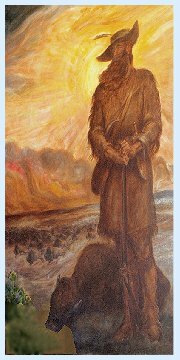 A warrior society composed of Cheyenne and a few Sioux, calling the elves the Dog Soldiers, was among those who insisted on ignoring the treaty and pursuing their way of life. As the buffaloes became sparser, the cattle kept by settlers had to serve as an acceptable substitute, and there were a number of raids on immigrant-owned establishments. The settlers feared for their lives. During this time, the American (Union) army was busy fighting the Civil War, but the states formed their own militias. The Colorado militia, under the leadership of Colonel John Chivington, attempted to stop the Indian raids. But they ignored an important fact: The hostile Cheyenne, in keeping with good guerilla practice, kept moving around and would not let themselves be found; on the other hand, there were Cheyenne who could be located because they were faithfully staying on the Reserve, even though they were starving. To whatever extent we may think of the "dog soldiers" as being guilty of violating the arbitrary and forced treaty, the people on the Sand Creek Reserve did not share in that alleged guilt. Here we see how deadly that attitude of depriving a person or a group of their unique identity and classifying them all under some dehumanizing label can be. Chivington and his would-be soldiers managed to kill a number of Cheyenne, most of them were not hostile. May 16, 1864: Hostilities increased when some Colorado militia men crossed over into Kansas and encountered a Cheyenne camp. Their chiefs (Lean Bear and Star) went up to greet them and to demonstrate their peaceful intent. Lean Bear, in particular was proud to show the medal and papers he had from Abraham Lincoln himself. But Lieutenant George S. Eayre and his accomplices never even got close enough to see what Lean Bear was proffering. They shot the Cheyenne at virtually point blank range. Even if the Cheyenne were not supposed to be there according to the dubious disputed treaty, neither did the Colorado militia have any legitimate business in Kansas. November 29, 1864: Colonel Chivington and his troops attacked Black Kettle's encampment. It was located on the reservation, and most of the people there at the time were women and children because the men were out hunting. Black Kettle added a white flag to the American one, not the last time he would do so uselessly. Over a hundred Indians were slaughtered and mutilated. Their scalps were displayed in Denver to cheering audiences. This travesty, which is now known as the Sand Creek Massacre, increased the number of Cheyenne who turned hostile. 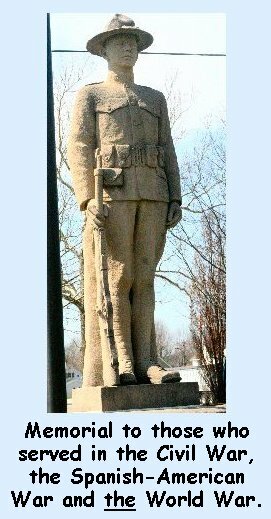 Black Kettle's second-in-command, Roman Nose, became a leading warrior among the Dog Soldiers. 1865: Black Kettle signed yet another new treaty according to which the Cheyenne would move to a new reservation in Kansas. Some of his tribesmen followed him, but some refused, and many of those who complied carried out raids from there. Within months, Black Kettle and his people were forced to move to another reservation, this one in Oklahoma. 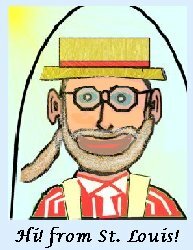 He took up residence in a village called Washita. 1866: Having won the Civil War, the veteran generals, such as Sherman, Sheridan, and Custer, now turned their attention west to contain the Indian "aggression." A word concerning Custer: Unique. Another word: Flamboyant. A few more words: Strong-willed, confident, capable, ambitious. According to some sources, his nickname "Autie," came from the mispronunciation of his own middle name as a little child; others maintain that it was based on his gold-colored ringlet locks. [I'm inclined to go with the latter idea since that's what the books I read in the past claimed. ( AU is the chemical abbreviation for gold.)] He loved the limelight and was just as willing to enjoy it politically as by military accomplishment, though his political connections burned out shortly after the Civil War. Even though he graduated at the bottom of his class in the military academy, he turned out to be an excellent battle commander, inspiring the soldiers under his direction by leading them into the action personally. He designed his own uniform, and the red scarf with which we may see him pictured was not a part of the uniform, but his own idea. He came from Ohio, but even in the South, operating alongside Sherman, he could display himself as a gentleman who respected Southern culture. I cannot think of the name of the town now because I don't have access to my trip journals, but he managed to keep Sherman from destroying a small town south of Fredericksburg because a woman had pleaded her case with him. His promotions in rank were well-earned, and his temporary designation as "general" during the Civil War, which he had to give up afterward, was returned to him again as an honorary title subsequently, though his official rank was Lieutenant Colonel. June, 1867, Sherman, Sheridan, and Custer were "patrolling" along the Western edge of increasingly settled lands. Custer was reporting to General Sherman, or rather he was supposed to, but did not necessarily check in regularly. He moved around his designated area with his regiment (the 7th Cavalry), but showed no inclination to initiate conflict, not even when he was aware of the close presence of some known hostile Cheyenne. Apparently, Custer's motivation was the conviction that, given the strength of his force, the result of any engagement would be yet another massacre of the Indians, and that there had been too many of those already. Alas, if so, he did not retain that perspective for long. Sherman had a message to relate to Custer. I don't know whether its content per se is relevant to subsequent events, but the fact that the message needed to be conveyed was. (The content was that Sherman was calling Custer to account for taking time off his job to visit his wife. Custer was court marshaled a while later and suspended, but almost immediately reinstated.) A young Lieutenant, by name of Lyman Kidder, was designated as the messenger. He was accompanied by ten soldiers and a Sioux Indian scout called Red Bead. Kidder and company never reached Custer. They were killed by a group of Cheyenne and Sioux warriors. Custer's scout found the bodies about ten days afterwards. There were further raids by Cheyenne and Sioux into Kansas, some of the others resulting in loss of life by the settlers as well. November 27, 1868: The 7th Cavalry under Custer followed the trail of some raiders to Washita, Black Kettle's village. The chief raised a white flag, but, once again, to no avail. Custer and his troups rode through the village, shooting every living being, including Black Kettle and his wife. There it is, the story of the "renegade Indians," as best as I've been able to put it together at the moment. As all of history, the closer you look to clear up ambiguities, the more ambiguities you find. But the ambiguities are there for the most part due to our humanity, the one thing that we all share, and, as long as we remain on that level, we can learn from the events and their stories. However, when we allow the characters to become faceless and identity-less, the stories lose their value. Then they no longer address us because then we have eliminated what we have in common with the human beings involved. And then, by dehumanizing them, we are really dehumanizing ourselves. The nature of these reflections is such that they involve some chronological nesting, or as the computer expression goes, "stacking." To help us to keep track I've indicated the levels as I go along. Stack Level 1:This entry will not be a lengthy termpaper. It is Wednesday evening. We finally got back home yesterday (Tuesday) afternoon. Stack Level 2: We left Topeka on Saturday afternoon, stopped for the night in Concordia, MO, wound up staying there an extra night because I was not doing all that well. We left Monday morning for home, but, at June's strong suggestion, due to my being quite foggy, we broke off in Illinois, and then got home on yesterday, Tuesday. By that point, I had once again taken ownership of a gigantic headache, which kept me pretty much non-functional for the rest of yesterday and most of today. Fortunately, today was the day on which Medicare allowed me to get a new Imitrex shot, and that helped greatly. I had glimpsed the motel on our way west and was wondering what that building could be. The front was obvious highly church-like, but then there were these motel-like roo attached. We decided to stop at that motel based on the billboard advertisements, and had no idea that it was that very same peculiar building until we pulled up. Concordia has a large Lutheran church, and the entire town is somewhat church-oriented in its architecture. It's pretty difficult to get a full picture of a large building in an urban setting, particularly without a wide-angle lense, so I stitched together several shots of St. Paul's of Concordia. Apparently, then, the builders of the motel attempted to fit in with the style. The effect is somewhat disharmonious, I'm afraid. I wrote some things, but obviously was hampered by not having very many resources at hand. Somewhere in the last entries, I said that I didn't remember which town it was that Autie Custer had protected. Now that I'm home, I've been able to check my trip journal. ---Let me clarify here that my interest in Custer is not something that just came about recently; he, as well as Native American tribes, have been objects of interest of mine ever since I was a boy in Germany. Tuesday, August 4, 1987. 61.5 miles. Fredericksburg, VA, to Richmond, VA. Lunch at Ashland, VA (claim to be the center of the universe). They wouldn't let us use the bathroo in the town hall--no public restroo --no southern hospitality. Interview with Susan of the local newspaper, who was really fascinated with the idea of a professor doing this. So am I. Hope to get a copy of that article. Stinking hot this afternoon. 100's plus. In case you're worried, I was able to wash up at the newspaper office. The town which was basically saved by Autie Custer, particularly the official records and documents, was Amelia, VA.. Here are some excerpts of my journal for that day. We had spent a day in Richmond doing a work project for a Christian school, so there was one day in between. Thursday, August 6, 1987. 68.6 miles. Richmond, VA to Farmville, VA. Lunch in Amelia--a really pleasant Southern town. In the town square park where we rested [Gen. Robert E.] Lee's troops once were camped. Thanks to the pleas of a local woman, Autie Custer protected the town from total destruction, particularly the town records. Custer was on the heels of Lee's march of retreat. Lee's troops had rested at Amelia, just where we were. He then headed southwest, but found his way blocked by Sherman. He then turned west and was defeated at the battle of Sayler's Creek by Sherman and Custer. 7,000 Confederate soldiers were captured. Lee headed further west to Appomattox. Of course, my American readers know that at Appomattox Lee surrendered to Sherman and the Union. Custer was present there as well and made sure he got into pictures and newspaper accounts. Pop back to Level 2: So much for this edition of "Stacking with Win." 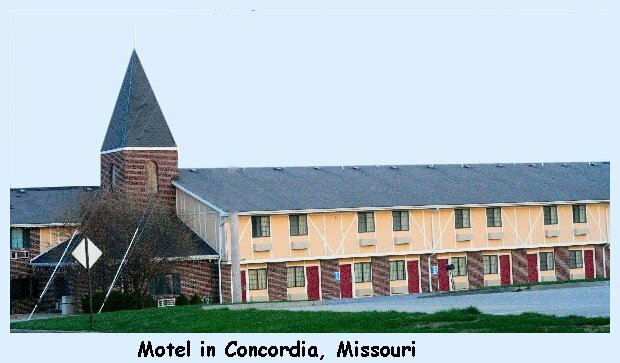 So, on Sunday afternoon, June and I went to look at the town of Concordia, Missouri. The motel information booklet listed a number of attractions at various locations, but, as it turned out, they were actually all accommodated in different corners of Concordia's Central Park, which was about a small block in size. In the picture, you can see about half of it. Leading the attractions was a rebuilt old-fashioned gear-driven clock. 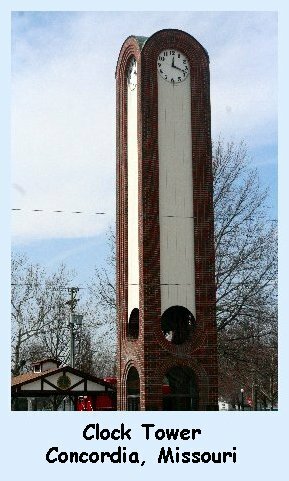 In the opening at the bottom of that tower, you can see all of the gears and ca . Unfortunately, the plexyglass was too reflective to get a good picture of those. 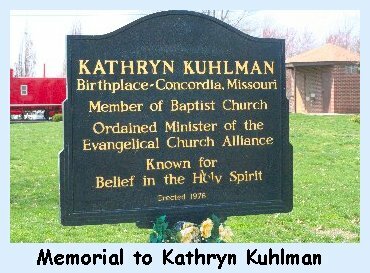 Right next to it was a memorial to the controversial evangelist and faithhealer Kathryn Kuhlman. I say "controversial," but I believe there are few people left nowadays who would not agree that the bulk of her ministry was fraudulent. But she was a famous fraud, and so the good townspeople of Concordia are taking a certain amount of ownership in her fame, to which they are entitled. It was fun to see a small town focus to such an extent on its place in the world, not to mention encountering an artist's or photographer's dream with so many subjects gathered in one place. Pop back to Level 1: Good night!